As much as I adored Prague, I was eager to make a day trip out of town to explore a bit more of the Czech Republic. We decided to visit the sleepy Bohemian town of Kutná Hora, as it was only a short bus ride from Prague and could easily be seen in an afternoon. Not only that, but Kutná Hora sounded really interesting too! The church of St. James is a defining landmark in Kutná Hora. Kutná Hora was founded in 1142 and went on to become the second richest city in the Kingdom of Bohemia. Below the town lies miles of exhausted silver mines, which in their prime, helped Kutná Hora compete economically and politically with Prague. Bohemia’s Royal Mint was here, converting Kutná Hora’s silver into coins that were used all over central Europe. Eventually the mines were depleted, some flooded, and the town that once was a favourite residence of Bohemian kings, quickly dwindled. Kutná Hora was added to UNESCO’s list of World Heritage Sites in 1995 because of its significance in human history. The Church of St. James was completed in 1420 and is the oldest church in Kutná Hora. The first thing I noticed about Kutná Hora, was the peacefulness. The slower pace and quiet atmosphere was a welcome reprieve from the crowds of Prague. Soon I became enamored with the city’s historic architecture. We wandered past many beautiful Gothic, Renaissance and Baroque townhouses. We even came across a unique stone fountain built in the 15th century. This twelve sided fountain was built in 1497 and supplied water to Kutná Hora. Water was transported through wooden pipes from a well four kilometers away. By the end of our visit we were amazed at how much there actually was to see and do in Kutná Hora. We didn’t get to experience everything this small city has to offer, but here’s a look at the few things we managed to see during our day trip to Kutná Hora. The Church of St. Barbara is the jewel of Kutná Hora. Dedicated to the patron saint of miners, St. Barbara, this Gothic masterpiece symbolizes the importance of mining in the once powerful Kutná Hora. The interior of St. Barbara’s Church is decorated with frescoes depicting life in Kutná Hora during medieval times. Motifs of mining and minting of coins frequently appear in the church’s decoration. While I appreciated the glimpses into secular life, my favourite part of the church was the ceiling. Staring up, its design looks like a row of huge flowers! It’s not unusual for churches of this size and time period to have taken many years to build. St. Barbara’s church was no different. Construction began in 1388 but wasn’t completed until 1905, lasting over 500 years! The Hussite Wars and lack of financial resources are to blame for the cathedral’s slow construction. The Italian Court is a palace that served many functions during its history. Initially, it served as a town castle, helping fortify the city and safely store silver ore.
During the reign of King Wenceslas II, minting experts from the Italian city of Florence were called in to start a currency reform. The Royal Mint was established in the now aptly named Italian Court and Prague Groschen coins started being produced. The palace also served as a temporary royal residence. This is where the King would stay when he was visiting Kutná Hora. The assembly room of the Royal Palace. Today, the Italian Court is a museum dedicated to coin minting. There’s an extensive collection of Kutná Hora coins and exhibits that re-create working conditions. We learned that workers were expected to make 2,000 coins a day, by hammering designs into round silver pieces. Many of the workers went deaf from all the hammering noise! Just outside of Kutná Hora, in Sedlec, is a world-renowned ossuary famous for its bizarre, yet artistic, arrangement of human bones. The chilling decorations made from 40,000 skeletons include a chandelier and coat of arms. It was such a fascinating place, that I wrote an entire post about this Bone Church. Definitely the highlight of our day trip to Kutná Hora! Kutná Hora was definitely worth visiting as a side trip from Prague. The Bone Church alone made the journey worthwhile, as it was the most unique attraction we visited during our five weeks in Europe. Overall, we had a lovely time during our tour of Kutná Hora and appreciated getting to learn more about the Czech Republic in a place that wasn’t overrun with tourists. Kutná Hora is a one hour drive east of Prague. There are plenty of tour companies offering day trips to Kutná Hora from Prague. Alternatively, you can take the train from Prague Main Station. Trains arrive outside of town, near Sedlec (which is handy for visiting the Bone Church). From there you can take a bus to the town centre. Hours for St. Barbara’s Cathedral are as follows: April-October 9:00am-6:00 pm, November-February 9:00am-4:00pm, March 10:00am-5:00pm. Admission for adults is 60 CZK, children and students are 40 CZK. Entrance to the Italian Court is by guided tour only. Hours for the Italian Court are as follows: April-September 9:00om-6:00pm, November-February 10:00am-4:00pm, October and March 10:00am-5:00pm. For information on visiting the Bone Church, see my post about the Sedlec Ossuary. Another point of interest that we didn’t have a chance to see, is the Czech Museum of Silver. Here you can learn about the history of Kutná Hora and the silver mining process. 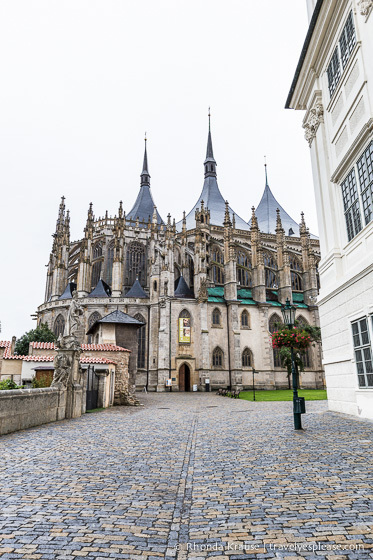 Here is a trusted site where you can buy digital tickets for your day trip to Kutná Hora and have them immediately delivered to your smartphone (no need to print). For your convenience, here is a list of hotels in Kutná Hora. Please consider booking your accommodations through the included link. It costs nothing extra and helps support this website. Thanks!